Navruz is widely celebrated in Uzbekistan. Nationwide festivities are held in cities and districts, villages and makhallas. Such spring dishes as sumalak, halim, samsa with greens, dairy soup, give splendor to the festive table. These celebrations strengthen in the hearts of compatriots a sense of gratitude for a peaceful and prosperous life, faith in the future of the country. The festive event in Yoshlarobod village of Fergana district also grew into a magnificent celebration. A feeling of gratitude for these beautiful, festive days of Navruz reigns in the hearts of people of all ages who came to festivities. The performances of amateur artists from Kadamjay district, songs in Tajik, Kyrgyz, Uzbek and Russian languages performed by Suluv Qiz ensemble of the regional Kyrgyz National Cultural Center became a vivid embodiment of generosity and interethnic friendship. Spring dishes – sumalak, halim, samsa with greens, manti, patyr, katlama and various delicacies decorated the festive table. Pilaf is cooked and served in a large cast iron cauldron. Artists and the collective of Vodil Chashmasi song and dance ensemble of the district house of culture performed songs and dances. Within the framework of the event, a competition for the preparation of pilaf was held, drag rope battle, kurash, launching kites and chess competitions among the older generation were held. The kurash competitions were held with special interest. The winners received gifts from the district khokimiyat and organizers of the event. A holiday in the center of Dangara district was ever more fun and lively. Young families, grandparents and their grandchildren came to festivities. Treats were served to all participants of the holiday. The performances of students of the junior sports school, competitions in national games aroused great interest among young people. Talented students performed songs and dances. 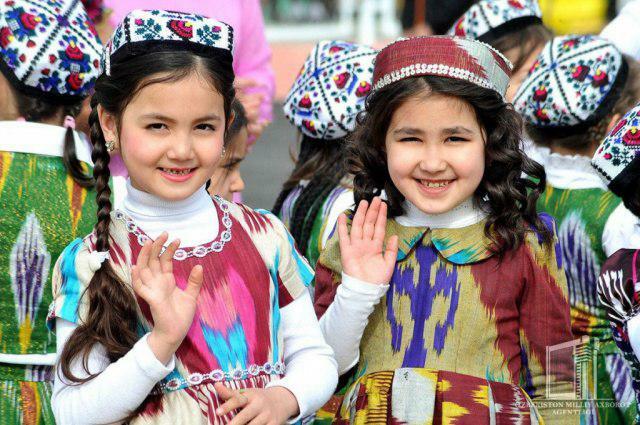 Navruz celebrations continue in all regions.